The trial of Mr Chông Kyông-hak (Jong Kyong Hak in the DPRK convention) has proceeded without any specific difficulties, judging from the Yonhap piece carried by Chosun Ilbo, except that judges are said to have been a bit at loss because it's been so long since such cases of directly dispatched spies have been tried in ROK courts. An interesting piece of info concerns Mr Jong's master's thesis in DPRK in 1989. His topic was "Study of reactionary character and fragility of the South Korean puppet army" (남조선 괴뢰군의 반동성과 취약성에 관한 연구), in which he stated for example that "because the South Korean army is a reactionary army in which individualism and mammonism (hwanggûmmannûngjuûi) are rampant, the class enmity between superiors and underlings must be induced and [the army] rebuked." 학봉 김성일 in Korean Wiki; born in Ûisông Kim lineage; was a disciple of T'oegye Yi Hwang with Sôae Yu Sông-ryong. Passed the highest civil service exam in 1567. He was dispatched to Japan in 1590 and returned early next year; in response to a memorial presented by one other official who warned that Japan's invasion was imminent, he maintained in his memorial that confusing people's minds (minsim) with the threat of invasion was more dangerous than "pirates of the island nation", for if the "people's minds" are lost, all the fortifications are of no use. (The Wiki entry says that Kim Sông-il has been wrongly accused of the lack of preparations before Hideyoshi's invasion.) Nevertheless, he took part in the defence of the country as an official, but contacted a disease and died during the hostilities in 1593. A small factoid is that one of the two founders of Trigem computer company is a direct descendant of Hakpong, and the other related to him through marriage; later, a descendant of T'oegye joined the company. 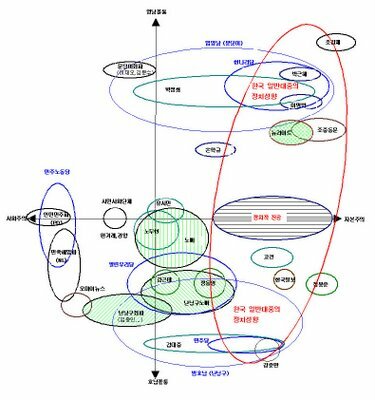 A graphic four-field representation of the South Korean political landscape has appeared (via Jinbonuri bulletin board). 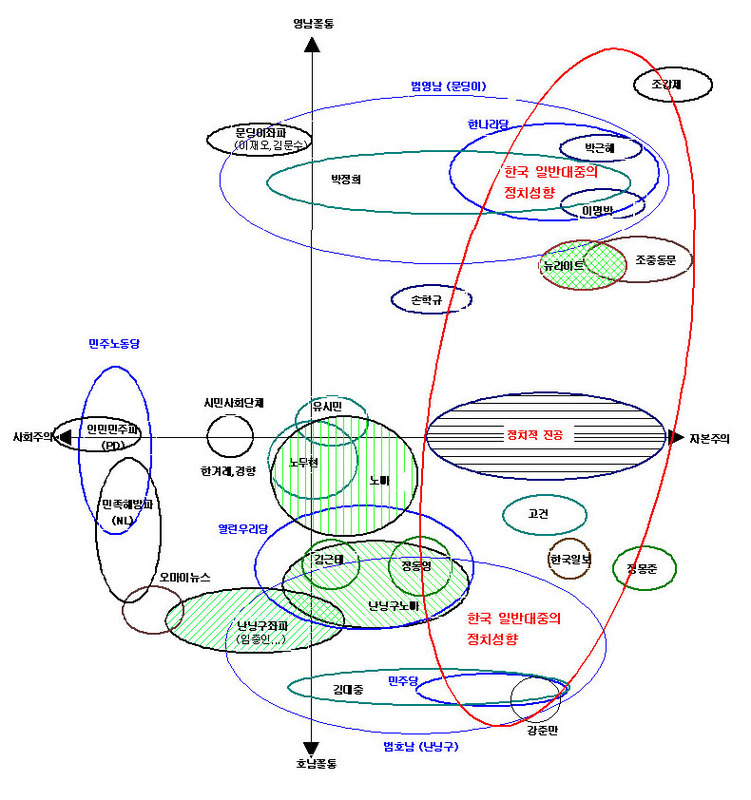 The four dimensions are "socialism", "capitalism", "Yeongnam kkolt'ong", and "Honam kkolt'ong". The big red circle is the "ordinary people's political leaning". Check how your favorite news outlet or politician situates! Korea Nat'l Housing Corp. becomes "Humansia"
I must have been searching for info about the present state of apartment construction work in what soon is only remembered as Nan'gok in Sillim 7-dong, Southern Seoul when I encountered a previously unheard term "Humansia." Turned out "Humansia" is the new brand, or signboard, of the Korea National Housing Corporation (Taehan Chut'aek Kongsa), defined as "not just a housing brand" but a new "urban brand" denoting the "creation of urban space good to live in and economically competitive, and public company realizing residential welfare" according to an introductory article in the real estate pages of Seoul Economy. Accordingly, the homepage of the corporation displays only the "Humansia" brand, and the old homepage is, well, outright termed as "old": old.jugong.co.kr. Housing corporation continues the imaginative use of linguistic entities associated with English languages in naming its new brand. The use of the first component "human" demands no further explanation, as the subtitle to "Humansia" is in'gan chungsim tosi, "human-centered city". The second component "sia" remains murkier for my linguistic perception, but according to the article in the above link it stands for "wide space, a site/lot" (넓은 공간, 대지 [垈地?]). It remains to be seen whether the name, which will be applied not only to residential houses but also to all other buildings in teh blocks, will be written in Roman or Korean alphabet. I'd think it'll be in Roman letters, since the brand design seems to be always that way. An interesting development indeed; the government-owned housing corporation enters the housing brand market with the stated reason that the housing brand market is "excessively confused and competed" (from the above link). It doesn't make sense to be only cynical towards such signboard change: improvement in the image of the public sector housing might at least alleviate the real and perceived increase of social polarization (or then it might heighten the drive of the private sector to distinguish itself further...). A recent piece of news in Hankyoreh was that apartment blocks are forbidden to repaint their old names to match the "apartment brands" that the original construction companies are currently sporting. 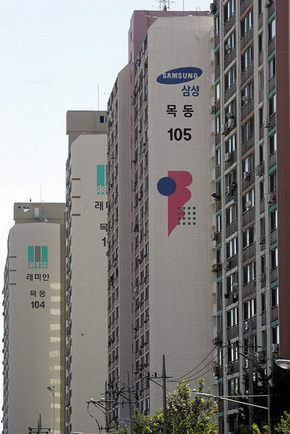 Thus, in a market situation when the term "apartment" (ap'at'û 아파트) in the apartment block name lacks to convey the idea of development and modernity, "Samsung Apartment" is not allowed to become "Samsung Raemian", or Hyundai Apartment to become "Hyundai I-Park", or "Dawoo Apartment" to become "Prugio" and so on. Seems that those already did the repaint job are allowed to remain so, while the future offenders are levied a hefty fine of five million won (4000 €). (What is 5 mil W compared to anticipated housing price hikes? And yes, the new apartments in former Nan'gok, to which residents have started moving in since the end of last month, are also branded "Humansia", as can be seen for example from the official site of the "redevelopment right owners' association" (that means those are entitled to acquire an apartment as it's been their property that was redeveloped). The abolition bill that was submitted already two years ago, despite having signed by a majority of lawmakers, hasn't gone anywhere from the legislation committee. No executions have taken place since the last days of Kim Young-sam's administration, when the authorities cleared the table, sarcastically speaking, for Kim Dae-jung's government. Neither KDJ nor Roh Moo-hyun have allowed execution of death sentences to take place. The Kyunghyang article gives also a summary of some cold (sorry sarcasm again) figures: in 2005, six death sentences were given in first trials (eight in 2004), and three sentences confirmed in the Supreme Court; presently there are 62 inmates in death row; 998 executions have taken after the establishment of ROK (what happened during the Korean War is apparently not included in this figure). We heard news about peasants and sweatshop workers rioting all around China on almost a daily basis. The least we can do together to support them is to bring at least a bit of disorder to streets of Helsinki as well. Expressing solidarity with oppressed people like Chinese peasants is all good - and Chinese peasants are truly oppressed - but don't ask solidarity from me if the police uncles see it appropriate and necessary to apply physical law enforcement on you; I'm going to side with the shopkeepers whose windows you're in all likelihood going to try to break. click to open a larger photo in a new windowIt is understandable that it's more difficult to get good photographs from a totalitarian country like PRC, so Korean pics can do as well: people look the same, and the writing isn't all that different either. And who knows if even the second pic from the left is from a place like Hong Kong and not from the mainland (my knowledge on police gear is very scant).